Why Pursue A Career In Skilled Trades? How many young folks have been told: “To get ahead in life you must have a degree”? As you reflect on that statement while standing in line at a coffee shop, have you ever wondered how many baristas pulling shots have a degree? Many! I’m not casting disparaging comments at colleges or baristas. We do need people to become educated as doctors, engineers, lawyers and many other professions. Obviously we want a pilot to be well educated on the dynamics of flight, but many young people are getting degrees in subjects with no promising opportunities while piling up huge school debts. Plumbing, Electrical, Heating, Ventilation, Air Conditioning, Refrigeration, Carpentry, Masonry, Cabinetry, Welding, and the like. Skilled trades are responsible for the building of our homes and offices. As a service (or repair) technician, you can expect to be working all year. Service techs are relatively “recession-proof” and will be working even when the economy takes a hit. During the big housing bubble recession I was living in northwest Ohio working as an HVACR tech making $40K! As long as people require comfort, running water and electricity, they will need a tradesman to help them! According to Indeed.com, the average senior HVAC technician is paid $23.70 per hour nationally. The national average salary for all occupations is $17.80 per hour. I could probably stop there but again I will refer to my own experience. During the last “great recession”, I was able to buy two cars and a home! In addition, according to the US Bureau of Labor and Statistics, the decade from 2016 to 2026 will bring about a 15% growth within the HVAC industry, which is above average! As of last year, the unpaid and unsecured student loans costs the taxpayer $1.4 trillion ($1,400,000,000,000) in the US!! Seven million people are in default with their loans. The average cost to obtain a bachelor’s degree is now $127,000. Many high school graduates attend college chasing a degree they have been pushed into with the promise of high earnings. They are often given little counseling on direction and cost, so they choose a liberal arts degree while accumulating a huge school debt with no feasible way to pay it off. Where is this land of milk and honey known as the “liberal arts” job market? I tell my students, “If you can’t find a job, it’s because of the person in the mirror, not the trades job market”. Trade schools cost an average of $30,000 and two or less years of your life. 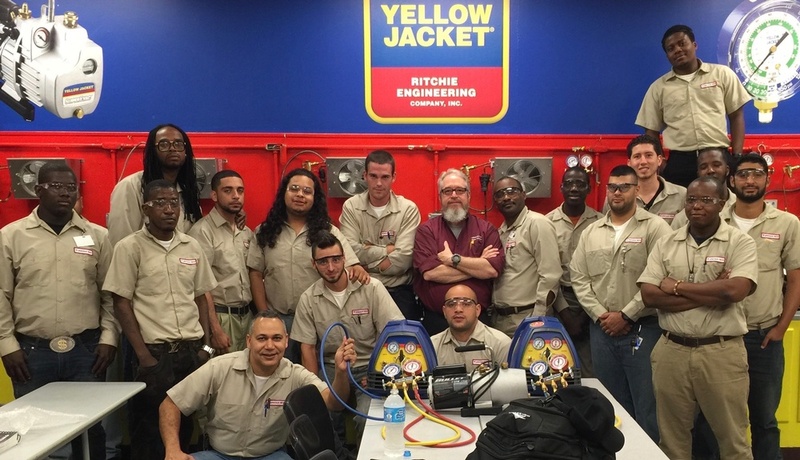 As previously stated, the HVAC industry is expecting enormous growth with a consistently high demand for skilled techs. If you are a senior tech, you can pretty much demand your salary and go anywhere in North America. .
One major drawback of the push for academia is the lack of skilled replacements for techs who are frankly too old to do the work. The skilled trade environment is not for the frail or faint of heart, as it can be very physically demanding. The percentage age 65+ technicians drops sharply in our field. As of 2013, 55% of skilled tradesmen were 45 years old. Please check out “America’s Skilled Trades Dilemma: Shortages Loom As Most-In-Demand Group Of Workers Ages” from Joshua Wright (Forbes Magazine). By the year 2030, 79 million skilled tradesmen will retire with only 41 million entering the workforce. The US Bureau of Labor and Statistics reports for every three skilled tradesmen that retire, there’s only one to replace them. In the same report, the average age of skilled tradesmen is 55. Again, I’m not anti-college. On the contrary, I believe in being well-educated, but without future financial destruction. Training within the skilled trades will always offer opportunities to earn and grow. By all means, embark on the career of your dreams, and if you are unsure, talk to someone before making any choices at 18 that your 28 year old self will regret!! If you “act your wage” (spend less than what you earn), stay out of consumer debt, you could be a millionaire at the ripe old age of 55. If I’m half wrong, you will have $500,000. Sound like a plan! ?